trying to understand the Bisq trade transactions in more detail and I’d like to know if there’s a reason as to why the payout transaction isn’t created at the same time as the escrow transaction. Also, could the traders be allowed to set personalized addresses for the payout transaction? It isn’t obvious to me why the payout must go to the Bisq internal wallet. If you’re aware of documentation that goes more in depth please share. If the payout tx is created before the fiat transfer the BTC buyer has no incentive to pay the fiat. The payout could be theoretically dont to any custom address but it would increase complexity (also from usability) and does not cleary add much value IMO. 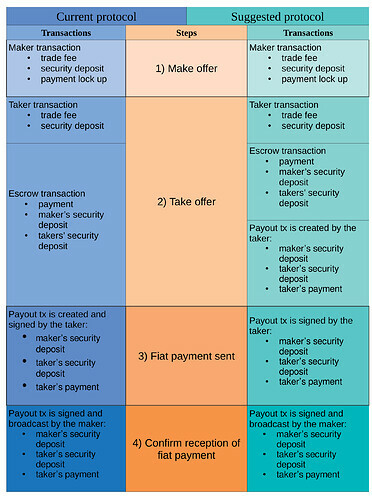 The payout tx would only be created, the taker (buyer of bitcoin) would sign it at the “I sent payment” stage and the maker (seller of bitcoin) would sign and broadcast it at the “I confirm I received payment stage”. possibility of enforcing off-Bisq contracts - if at the “Take offer” screen I could set one output to x address and another output to y address (overriding the default “Security deposit refund address + release of payment address”) and be sure that the Bisq software would enforce that, I would be able to share that screen with a possible lender and have them fund the trade (trade fee + security deposit + mining fees) knowing that I couldn’t defraud them. It’d be also great if one could also define the split of the total amount. This could be behind a “Advanced Options” to not confuse uninterested parties. The buyer already sends and signes the payout tx when he sends the payment started messages as he has nothing to lose at that moment. Not many people use the external wallet feature I assume. I assume most people who buy bitcoin on Bisq plan to withdraw it from the Bisq internal wallet to an external wallet. Only frequent traders would benefit from keeping it on the Bisq internal wallet.